Recently inspired by Chad Ashley’s test with the alCurvature shader by Anders Langland, I thought I would also give it a test. It seems very useful for creating ‘dirt map’ effects. In the examples below it has been connected to the Diffuse Roughness attribute of the alSurface shader. The examples below show both Negative and Positive modes (Positive selects convex regions while Negative selects concave regions of the turtle’s shell). They use decreasing Radius values (smaller values pick out finer detail in the model, while larger values give a smoother result). 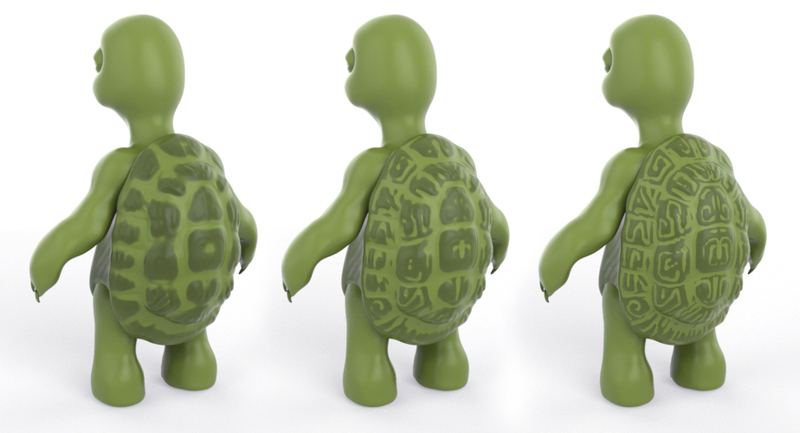 Many thanks to Josh Alexander for the use of his very cute turtle model. The slides from my presentation at FMX 2015 can be found here (35,191 KB).